Get all that BeFreeForMe has to offer! From daily inspiring thoughts, direct links to hot coupons & samples, monthly newsletters, and informative product reviews followed by free samples and coupons sent direct to your home…. BeFreeForMe has something, and everything, for the savvy gluten free and allergen free consumer! Sign me up for the following. We will only send to you what you request. Ask BeFreeForMe Sent weekly to your inbox. Got Questions? We got the answers: Whether it’s what to do to prepare for a nut free sleep-over or the secret to making a delicious gluten free turn-over. You ask and we’ll answer. BeFreeForMe will answer one of our member’s questions every week. BeFree FreeBe Sent periodically throughout the year to your inbox. 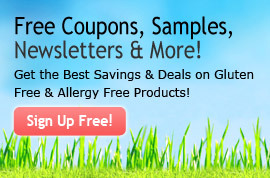 Emails full of tidbits and tips on gluten free and allergy free offers found online. All based upon your personalized dietary preferences. Free Thought Sent Monday through Friday to your inbox. Daily quotes and inspiration to free ourselves. Solitude, laughter, peace, or enlightenment delivered to your inbox daily. Free Samples & Coupons sent to your home / Newsletter Samples & Coupons sent periodically throughout the year - direct to your home. Product Review and informative email Newsletter sent to your inbox monthly. Some examples of how BeFreeForMe can help you sample & save include being able to try a new nut free cereal so you can try before you buy, saving on gluten-free pasta with a dollar-off coupon, or receiving a coupon-code to use at your favorite gluten-free website. Let BeFreeForMe help you sample and save! Remember, savings, product offerings and coupons vary each month, so sign up today to receive the latest savings. The more we know about you the better able we are to find coupons & samples that meet your needs, as well as select the best matched members to send samples and coupons to. We promise to keep all information confidential and we will never sell, share or rent your information to anyone ever. Which of the following coupons / samples are you the most interested in receiving? What is your biggest frustration when purchasing gluten / allergy free products? Check all that apply. Not being sure which restauraunts are able to accomodate gluten free / allergen free restrictions. The limited amount of retailers that carry a good selection of gluten / allergen free items. Lack of retailers that use signs / shelf tags easily identifying gluten / allergen free items. I/We are expecting at this time! I have children between the ages of 13-18. I have children between the ages of 7-12. I have children over the age of 18. I am planning to start a family within 12-18 months. I have children under age 6. What describes your household income? Please read the disclaimer and check the box below if you agree with it and would like to become a member. Yes, I agree with the disclaimer. Sign me up!